When the news broke Saturday (Aug. 25) that Armstrong, 82, had passed away, it is likely that many people's memories of the first man on the moon were of black and white television images or color film stills. 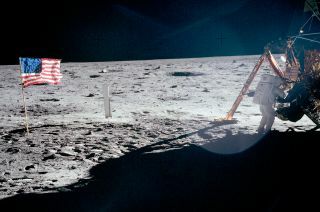 If they did recall a photo captured during the Apollo 11 moonwalk, it was almost certainly one of Aldrin, whether it was of him saluting the flag or looking down at his bootprint. In fact, perhaps the most iconic photo taken of an astronaut on the surface of the moon is also of Aldrin. A posed shot, he is facing the camera with the reflection of his photographer, Armstrong, caught in Aldrin's golden helmet visor. Neil Armstrong, seen here aboard Gemini 8, was the first U.S. civilian to fly into orbit. Armstrong had retired from the U.S. Navy in 1960. This photo was relatively rarely-seen until it was used as the cover of Armstrong's authorized biography, "First Man" by James Hansen. [More photos at collectSPACE.com]. A few of those other photos ran alongside obituaries in the numerous newspapers that told of Armstrong's death in their Sunday editions. But they — the photos, not necessarily the obituaries — only told part of the story. A great many lesser seen photos capture Armstrong as the research pilot, astronaut, engineer and, as his family described in a statement, "a reluctant American hero." To help illustrate that record, collectSPACE.com asked RetroSpaceImages.com to search their extensive archives of NASA photographs and pick out those that showed the Armstrong that the public didn't always get to see. The three dozen photos they chose have been presented chronologically, with one exception: the gallery begins with the rare photo of Neil Armstrong walking on the moon. Click through to collectSPACE to view the full gallery of Neil Armstrong’s photo legacy.